NECA will be releasing more than 50 of their licenses in their new "Scalers" line of decorative cord accessory figures this year. For now, we have a look at a few of their offerings as well a closeup look at the Jason Voorhees 2 inch figurine. 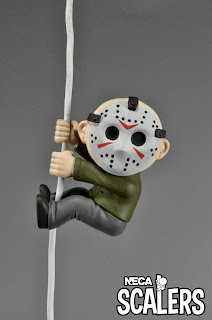 Keep an eye out for more information on this new line over at the Scalers website which includes Jason and other figures to be released in 2014. For now, take a look at the new trailer for the mini figures and see what you're getting from the petite Jason Voorhees and other genre figures. Will you be collecting these tiny little guys to hang on a cord near you?